If you missed the news this morning, Blizzard is leaving its real-time strategy wheelhouse to develop—I swear—a first-person shooter titled Overwatch. “Wait, the Blizzard? Of Diablo and StarCraft and WarCraft fame?” Yeah, that Blizzard is making a shooter. Prior to this morning’s keynote, I even tweeted about the possibility as a joke. That’s how remote the idea seemed. And then it happened. Moreover, the game is surprisingly good. We don’t know much of the lore behind Overwatch yet. Judging from the trailer, it seems that the titular Overwatch was a band of heroes that restored peace to Earth after a period of extended warfare. For whatever reason, Overwatch was eventually disbanded, with the various heroes turning into mercenaries. Now they’re back and fighting. From Blizzard’s Overwatch panel this afternoon it seems like each character has an extensive background. Because this is a fully multiplayer shooter, however, there’s no telling what form the “story” will take in the finished product, especially since characters can fight on both teams simultaneously—there aren’t identifiable factions in the game as it currently stands. There are already more than a dozen characters to choose from in the demo here at BlizzCon, each with unique abilities and guns. 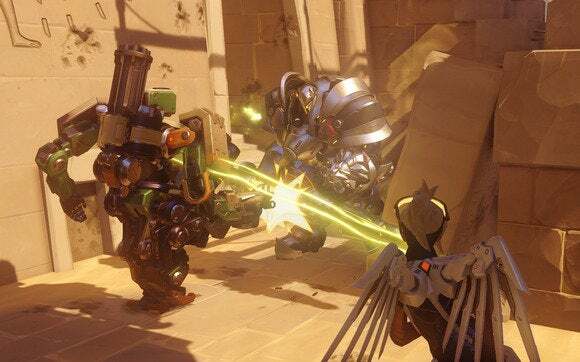 Characters are split into four different groups: Offense, Defense, Tank, and Support, though according to Blizzard these groupings are “loose” and are only there to guide players toward a specific play-style. The demo consists of two rounds, one where your six-person team is on offense and one where you’re on defense. There are two objectives you either need to capture or defend, with the attacking team racing against a time limit. Blizzard’s also shown off a cart-push level, where one team has to get a railcar from one end of a level to the other by standing on it. Step off, and the car starts slowly rolling back to the start. If Overwatch sounds a lot like Team Fortress 2, well, it is. It’s a bit slower-paced than Team Fortress 2, but from the hyper-stylized and colorful art style to the various character roles, Valve’s legendary shooter is a good touchstone. Defenders have two minutes to prepare for the attack, while the attackers sit in a room and wait. You’re able to see every character your teammates have chosen from the character select screen, allowing you to outline a plan and fill holes in your roster, but as far as I could tell every single person on your team could play the same character if they wanted. I started off with one of the characters from the trailer—the masked Reaper, who wields dual guns, teleports, and is wreathed in shadow. To give you an idea how the game plays (for those who don’t play Team Fortress 2), you fire your primary weapon with the left mouse button, but you can also trigger multiple special abilities by tapping the E, Q, and Shift buttons. The Reaper, for instance, can go all Gun Kata (warning: violence) on enemies, firing all around him at different angles. 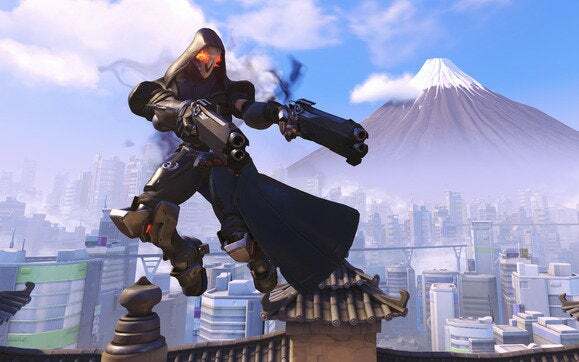 Characters also have a passive ability, such as The Reaper’s ability to regenerate health from kills, and then an Ultimate Ability, which is charged over time by dealing out damage or fulfilling other conditions. For instance, Mercy is one of the Support characters. She’s an angel-style character and functions as the game’s healer. Heal enough of your teammates and Mercy’s Ultimate Ability unlocks, giving her the power to resurrect a dead teammate. Used at the right time, it can completely change the tide of a battle. 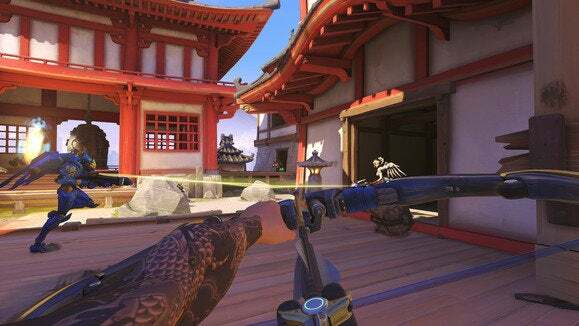 Then you’ve got Hanzo, who wields a bow and arrow, and Bastion, a robot that can transform from a mobile assault rifle class to a stationary turret. And again, these are just the four I got my hands on. There are over a dozen characters in the game right now, from an enormous spectacle-wearing gorilla that punches enemies in the face and generates shields for teammates, to a fast-paced teleporting pistol-user, to a robot that (as far as I could tell from watching over someone’s shoulder) buffs enemies and karate-chops the air to shoot. It reminds me of what Blizzard has done with Heroes of the Storm—looking at what Valve has done with Dota 2 and then making a more streamlined, accessible version of the game. In this case, Overwatch feels like Team Fortress 2 but without years and years of add-ons, expansions, hats, and baggage. That’s not going to appeal to everyone. Some people really love the complexity inherent to Team Fortress 2 at this point. What I played of Overwatch was fantastic, though. It’s gorgeous, it’s as responsive as you’d hope for a PC-exclusive shooter, and the way the various characters synergize and complement each other is seamless at the moment without feeling overwhelming to simply jump into. In other words, Blizzard is making a shooter, and it seems good. Count me surprised. This is honestly the last thing I would’ve expected from them, but Blizzard’s come out with all the grace and competence of a veteran shooter developer. I guess all those years developing the now-canceled StarCraft: Ghost and Project Titan (the DNA of which is in this game) came in handy. Look for the beta sometime in 2015—I think you’re going to like it.